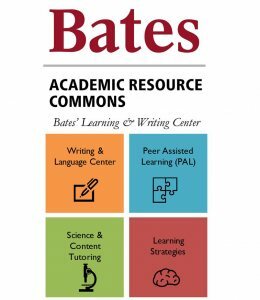 The Peer Assisted Learning (PAL) program began at Bates in 2003 and has been a vital part of learning in the sciences ever since. Following the model of supplemental instruction, PAL is an opportunity for peers to learn course content, outside of the classroom, from one another in a non-competitive and inclusive way. Because students facilitate the program for their peers, learning occurs without the apprehension that students sometimes feel when meeting with their professors for extra help. PAL Leaders design their sessions not only to help students master their current course material, but to also help students build lasting learning strategies that they can take with them to other courses and into their professional lives. Many students find introductory and “gateway” courses in the sciences difficult because they are not aware of alternative ways of studying and acquiring knowledge. The PAL program is open to anyone who wants to broaden their approach to learning through practice with their peers. Using multiple group learning methods, students develop a keen sense of “what to learn” and “how to learn”, and eventually gain a deeper appreciation for “why” they have chosen to learn the material from these courses. Please see our current schedule of PAL sessions here. PAL Leaders are students who successfully completed the course they are leading and who are willing to use their first-hand experience and knowledge to help their peers become better learners. PAL Leaders share strategies that aim to build readiness and comprehension. Ultimately, PAL Leaders work to help students understand that problem solving is a process, and that with practice students can claim authority of their own learning. PAL Leaders participate in bi-weekly staff meetings and training sessions throughout the semester to learn from one another and to support their own development as peer leaders.